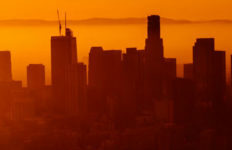 As “bad” ozone remains at unhealthy levels due to unusual weather patterns, Southern California air quality officials announced Friday that they will request five more years to meet federal standards. According to the Environmental Protection Agency, two types of ozone exist. The more popular variety, stratospheric, protects earth from ultraviolet radiation emitted by the sun. However, the other type of ozone, ground-level, is “bad” and can cause serious health risks, including lung and pulmonary disease, according to the EPA. For Coachella Valley residents, the “bad” variety has been a problem for years. In 2003, ground-level ozone was measured at 0.108 parts per million, which is well over the 0.08 ppm standard set by the federal government in 1997, which makes the Coachella Valley out of compliance with the EPA, according to South Coast Air Quality Management District officials. Due to ozone reduction programs, that rate went down to 0.87 in 2016. SCAQMD spokesman Patrick Chandler also noted that recent Southern California wildfires have negatively impacted the air quality in the Coachella Valley, and causing the ground-level ozone ppms to rise as ash is blown to the region. In order to remain within federal guidelines, SCAQMD officials announced Friday that they will request to be reclassified as “extreme,” instead of the current “severe-15.” The reclassification would give the agency another five years to attain healthful air quality standards. The “extreme” classification would not only give SCAQMD officials more time to meet EPA standards, but would also result in stricter emissions thresholds, according to the air quality agency. However, if the reclassification is not permitted, then around eight large Coachella Valley businesses, such as power generators, will pay a hefty $10,000 fee per ton of nitrogen oxides and other volatile organic matter that each company produces. Chandler did say that most of these companies have already taken steps to reduce their emissions and are already well below federal standards. SCAQMD officials said they will present the reclassification plan in June to the EPA Governing Board, the same month they are currently expected to meet federal air quality standards. More than $50 million already has been provided by SCAQMD over the years to the Coachella Valley, which helps fund road and parking lot pavement projects, clean energy projects, as well cleaner vehicles.